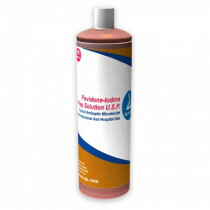 Povidone Iodine PVP-I is the universally preferred iodine antiseptic for Wound Care Prep. This antiseptic was found to be less toxic than tincture of iodine with a slower release of iodine from the formulation. Povidone Iodine has a very strong anti-bacterial function. Sold since 1955 as an anti-bacterial agent, Povidone Iodine is a stable mixture of polyvinylpyrrolidone and iodine. Povidone Iodine is soluble in cold water, ethyl alcohol, isopropyl alcohol, glycerol and polyethylene glycol. Povidone Iodine as an antiseptic kills prokaryotic cells, eukaryotic cells, bacteria, fungi, protozoa and viruses. PVP-I stains the surrounding area of the wound with a yellow to orange tint. Popular formulations of Povidone Iodine PVP-I from Dynarex and ReliMed include Betadine Povidone Iodine Scrub Solution, Betadine Povidone Iodine Prep Solution, and Betadine Povidone Iodine Prep Pads. For pre- and post-operative skin cleansing. For the treatment and prevention of infections in wounds, ulcers, cuts and burns. For the treatment of infections in decubitus ulcers and stasis ulcers. For vaginitis associated with candidal, trichomonal or mixed infections. Betadine Povidone Iodine Scrub Solution - 7.5% Betadine Povidone Iodine Solution. Betadine Povidone Iodine Prep Solution - 10% Betadine Povidone Iodine Solution. 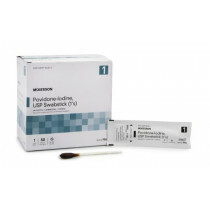 Betadine Povidone Iodine Swabstick Singles - 4 Inch Betadine Povidone Iodine Swabs. 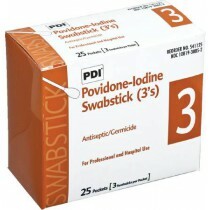 Betadine Povidone Iodine Swabstick 3 Pack - 4 Inch Betadine Povidone Iodine Swabs. 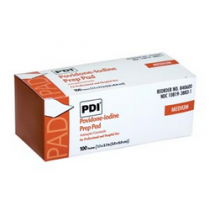 Betadine Povidone Iodine Prep Pads - 2-3/8 Inch x 1-1/4 Inch 4 Inch Betadine Povidone Iodine Antiseptic Towelettes.